Hung from an eave, tree branch, window frame or bird feeder, these swallows reflect personality as well as species-specific traits. Not just a decoration for your garden or yard, this character-filled bird figure is a unique addition to the top of a door, a fireplace mantel, a light, or a shelf in your home. 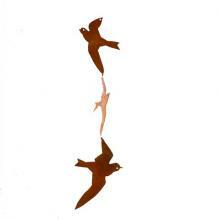 Indulge your love of swallows with this artistic design that you can enjoy year-round. Just twist to add dimension! This silhouette of three swallows twirling around each other has been hand-crafted with pride in the USA from steel and individually rusted by hand for that endearing shabby chic look. Birds are connected by the wings and shipped flat.